Drinks giant Coca-Cola has backed a campaign for a deposit return scheme for cans and bottles in Scotland. A spokesman for the company said the "time is right" to try new measures like a "well-designed" deposit system. Campaigners have called for a scheme where shoppers would pay a deposit when buying cans or bottles, which would be refunded when they return them empty. Former environment secretary Richard Lochhead said Coca-Cola's backing was a "significant development". 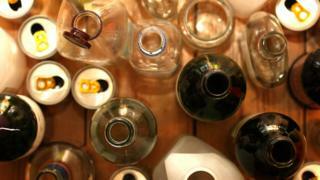 The Association for the Protection of Rural Scotland (APRS) group has led the "Have You Got the Bottle?" campaign, lobbying ministers to bring in a deposit scheme. A Coca-Cola spokesman told Holyrood magazine: "It's already clear from our conversations with experts that the time is right to trial new interventions such as a well-designed deposit scheme for drinks containers, starting in Scotland where conversations are under way." He added that the firm had made "significant progress" in recent years towards making its packaging more sustainable, and was now looking at "ways we can collaborate with others to improve recycling rates and reduce litter". Campaigners hailed this as a "truly landmark moment", noting that the firm had previously opposed similar schemes. SNP MSP Mr Lochhead, who examined such schemes when he was a cabinet secretary, said: "This change of heart by the world's biggest soft drink company is a very welcome and highly significant development in the campaign to introduce deposit and return schemes for drinks containers to improve recycling and tackle litter. "It is refreshing that such a major player in the industry is willing to change its mind after looking at how such schemes work in countries around the world." The Marine Conservation Society said it was "great to see Coca-Cola recognise the advantages" of such a scheme, while WWF Scotland said they "very much welcome" the move.